2017 was a tough year to beat after coming down from Canada’s 150th and Ottawa 2017 celebrations. With that being said, the team at Shaw Centre loves a good challenge and this challenge was accepted with open arms. It was yet another successful year with over 485 total events and 48 conventions hosted at the Centre. Here’s a look back at some key events that made a mark at the Shaw Centre in 2018. Political parties of all levels often gather at the Shaw Centre due in part to its proximity to Parliament Hill. The literal view of our political landscape seen from our third and fourth floors is another draw! The NDP Convention saw over 2,000 delegates where they debated and voted on policy resolutions and defined their stance on environment, economy, and foreign affairs. The building was a sea of orange for a few days and it made for a bustling time for the Centre. Northern Lights is Canada’s leading Arctic and Northern Canada showcase. The event consisted of workshops, key note speakers, and an Arts and Culture Pavilion setup in our Parliament Foyer where established artists, craftspeople and performers were featured with a variety of goods available for sale. This event continues to grow more and more each year and provides participants with an advanced look into Northern culture, tourism and economic development, and business practices. The event will be returning to Ottawa and the Shaw Centre once again in February of 2020. The Ottawa-Gatineau International Auto-Show has been hosted at the Shaw Centre for the past x years. It showcases over 300 vehicles featured by 34 brand manufacturers, including supercars, all the latest vehicles, cars, trucks, minivans, SUVs, electric vehicles, and custom bikes. This full-building takeover brings in tons of foot traffic and allows the general public to see the Centre in its entirety. Shaw Centre hosted Ringside for Youth XXIV for the sixth consecutive year to a sold-out crowd of 1200 guests. Canada Hall’s event space was completely transformed into an arena-like atmosphere featuring a regulation-sized ring. Very few fundraisers in Ottawa have gone the distance quite like this one, an annual dinner and boxing night that has raised millions of dollars for the Boys and Girls Club of Ottawa. We’ve seen our Trillium Ballroom transformed on countless occasions, but never have we seen the floor filled with over 500 yogis. 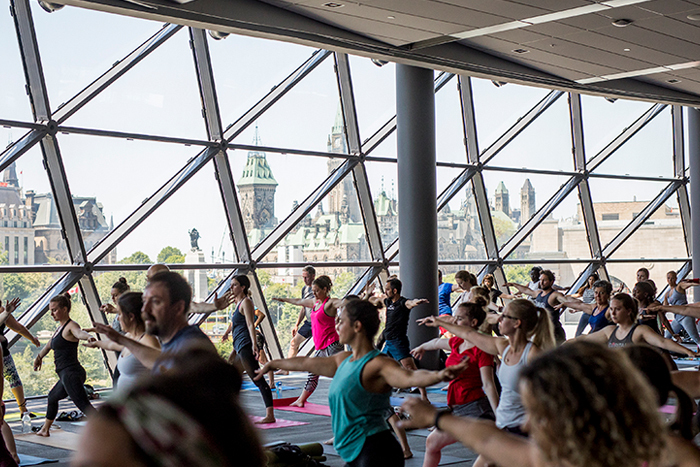 Shaw Centre had the opportunity to collaborate with Lululemon to host their weekly Parliament Hill Yoga session when Parliament Hill’s grounds were still being reconstructed following Canada Day celebrations. Our view of Parliament and the Ottawa cityscape made for the perfect relocation of this iconic summer event, while giving many local yogis an inside look of the Centre and its facilities. 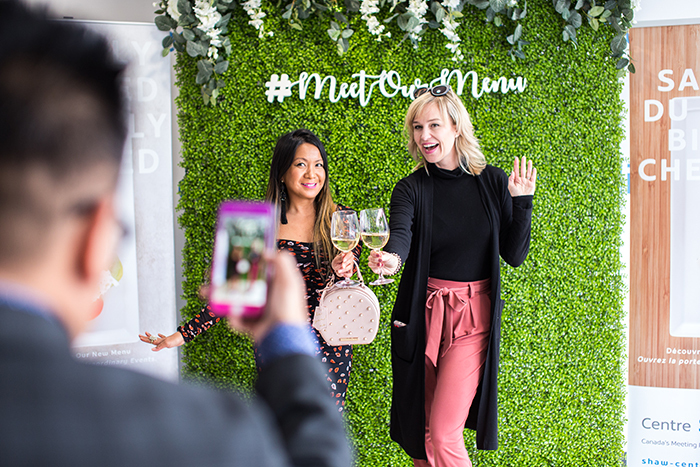 Although this was by no means a large scale event, this event was significant to the Shaw Centre team because it highlighted new and exciting things ahead. This event was to celebrate the first full menu redesign the Centre had seen since Executive Chef Turcot stepped into his role back in July of 2017. Attendees, comprised of many local influencers and industry leaders, were also able to get a first look at a special short documentary film featuring Chef Turcot. A special announcement was also made at the event which welcomed Big Rig Brewery as the Shaw Centre’s Official Partner of Local Craft Beer. This was the first official partner announcement made by the Centre, with many more in the works for 2019. The CSAE National Conference was an exciting event for the Shaw Centre team to host because it’s a top industry event. 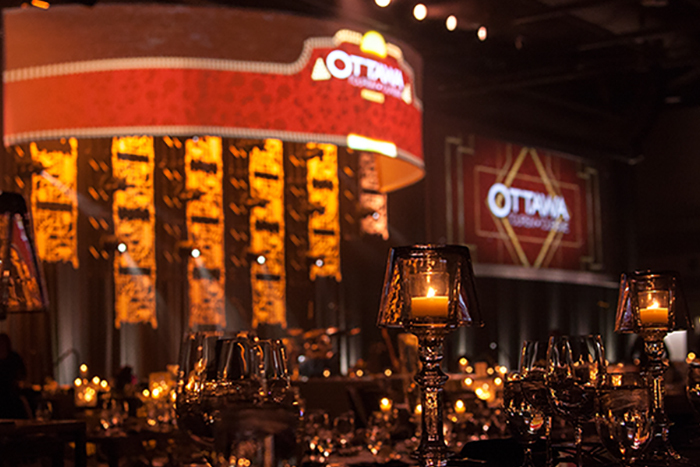 The three-day event from October 24-26 was filled with planning sessions, workshops, keynote speakers, and an impressive gala reception sponsored by Ottawa Tourism. Members from our sales team attend this event every year with the intention to forge and strength connections with association professionals, so it was extra gratifying for the Centre to host the event and showcase our facility and services to these key members of the industry. It was a big year for the Canadian cannabis industry with the debut of legalization. The Shaw Centre was ahead of the curve, having hosted the Cannabis and Hemp Expo the year prior. This year’s event sparked more curiosity with many individuals wanting to learn more and educate themselves on this new and growing industry. The event’s seminars covered various topics from investment opportunities to cooking with cannabis. 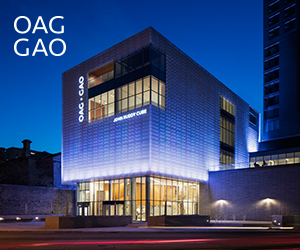 This event is a great example of how the Shaw Centre encourages innovation, adapts with the times, and works with clients to provide custom experiences. This was Shaw Centre’s third year hosting Canada’s only SAAS (software as a service) conference. It’s an opportunity for members of Canada’s tech community to gather, share insights, provide opinions, and seek new opportunities for the future of the industry. The event saw over 1500 attendees, 500 companies such as Shopify, Microsoft, Klipfolio, KPMG and LSpark, 70 speakers including representatives from Amazon and Lyft, and 40 sessions.